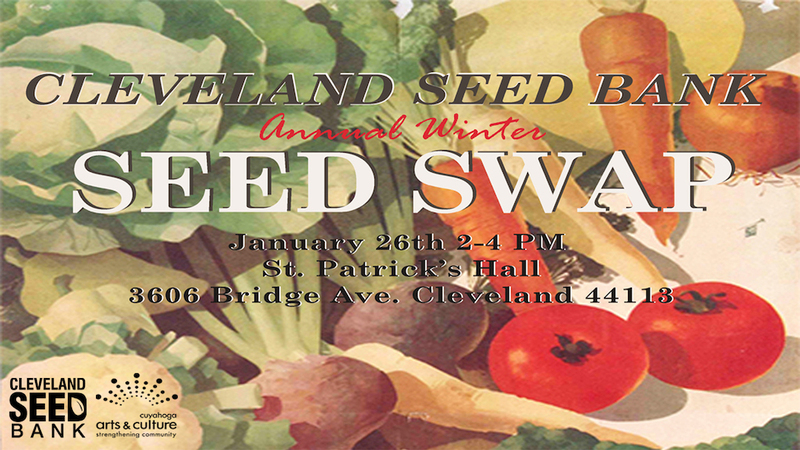 Join us in celebrating National Seed Swap Day by attending our 5th Annual Winter Seed Swap on January 26th. NO seeds required, but if you have them to share then please bring them! We’ll bring seeds with us for those who may not have seeds of their own to swap. Feel like you need to bring something anyways? We will have a collection box for food items to donate to a local pantry. Envelopes, labels, markers, and seed saving knowledge is provided by the Cleveland Seed Bank. Everyone will leave with seeds, new garden friends and a renewed enthusiasm for seed saving! Don’t forget your sourdough starters, cheese and yogurt cultures, kefir grains and kombucha scoby to share! Looking forward to seeing everyone on the 26th. The event is open to all, with a suggested $5.00 donation to help support our 2019 programming. Register at the link below to pre-order your tickets! Plenty of street parking is available as well as a few spaces in the parking lot attached to St. Patrick’s. Ohio City is conveniently accessible on the RTA Red Line (West 25th Street Station). Please visit www.riderta.com for schedules and fares. No Comments to "5th Annual Winter Seed Swap"